477 Beacon is located on the south side of Beacon, between Hereford and Massachusetts Avenue, with 475 Beacon to the east and 479 Beacon to the west. 477 Beacon was designed by architect William Whitney Lewis and built in 1889-1890 by T. J. Lyons, mason, for Joseph F. Page of Philadelphia. He is shown as the owner on the original building permit application, dated June 3, 1889, and on the final building inspection report, dated June 4, 1890. 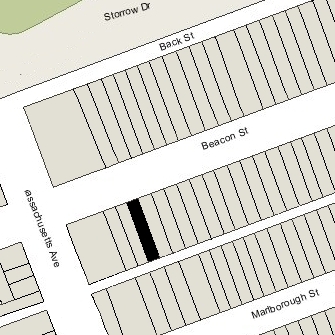 Joseph Page purchased the land for 477 Beacon on April 12, 1889, from Frances Anne (Codman) Sturgis, the widow of architect John Hubbard Sturgis. The lot was part of a 375 foot parcel John H. Sturgis purchased on January 24, 1880, from a real estate investment trust formed by Grenville T. W. Braman, Henry D. Hyde, and Frank W. Andrews. The trust had purchased the land from the Boston Water Power Company on March 1, 1872. The 375 foot parcel was one of three John H. Sturgis had purchased in January and February of 1880 comprising all of the land on the south side of Beacon from a line 198 feet west of Hereford to Massachusetts Avenue, with a frontage of 442 feet. Click here for an index to the deeds for 477 Beacon, and click here for further information on the land on the south side of Beacon between Hereford and Massachusetts Avenue. Joseph Page had 477 Beacon built as the home of his son-in-law and daughter, Winthrop Motley Burr and Frances (Page) Burr. They had married in February of 1887 and lived at 30 Exeter Street before moving to 477 Beacon. Winthrop Burr was a stock and note broker. The Burrs continued to live at 477 Beacon during the 1891-1892 winter season, but moved thereafter to New York City. On February 20, 1892, 477 Beacon was acquired from Joseph Page by Eben Sutton, Jr. He and his wife, Anna Boyd (McAtee) Sutton, made it their home. He was a stockbroker and previously had been superintendent of his father’s woolen mills in North Andover. On October 13, 1898, Eben Sutton transferred 477 Beacon into his wife’s name. They continued to live there during the 1899-1900 season, after which they traveled in Europe and Africa for a year, settling in Baltimore upon their return. On April 16, 1900, 477 Beacon was acquired from Anna Sutton by Alden Augustus Thorndike. He and his wife, Helen Grace (Hackett) Thorndike, made it their home. They also maintained a home in Braintree, where they were living in June of 1900 at the time of the 1900 US Census. His mother, Elizabeth Jane (Hayden) Thorndike, widow of Samuel Worcester Thorndike, lived with them. Alden Thorndike managed the estate of his grandfather, James Pettee Thorndike. By the 1901-1902 season, they had all moved to 472 Commonwealth. 477 Beacon was not listed in the 1902 and 1903 Blue Books. On July 31, 1903, 477 Beacon was acquired from Alden Thorndike by morocco leather manufacturer George Irving Pevear. He and his wife, Carmelita H. (Chamberlain) Pevear, made it their home. They previously had lived in Newton. 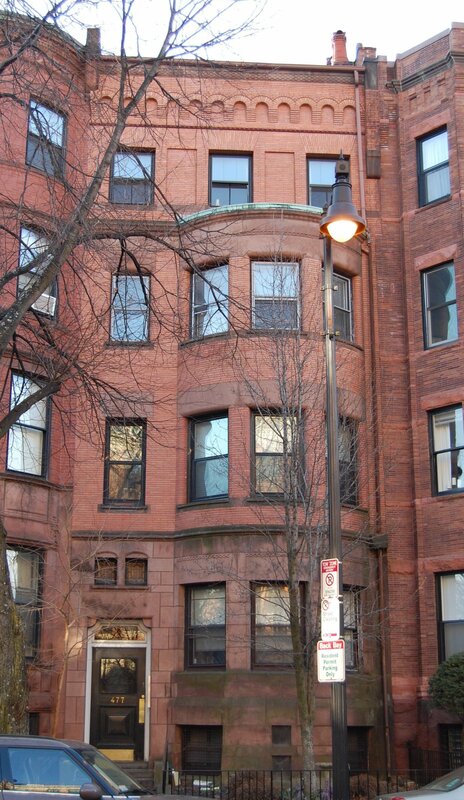 They continued to live at 477 Beacon during the 1909-1910 season. On January 11, 1910, he transferred the property to his business, Pevear & Company, Inc.
By the 1910-1911 winter season, the Pevears had moved to an apartment at The Stoneholm at 1514 Beacon in Brookline. They appear to have separated thereafter, and G. Irving Pevear was living at the Algonquin Club at 217 Commonwealth at the time of his death November of 1913. On September 10, 1910, Evan J. Fraser-Campbell, trustee of the City of New York, foreclosed on a mortgage it held on 477 Beacon and sold the property to Dr. Joseph Emmons Briggs. He and his wife, Flora L. (Toulmin) Briggs, made it their home. They previously had lived at The Colonial at 382 Commonwealth. They also maintained a home in Dighton. On September 20, 1910, Dr. Briggs transferred the property into his wife’s name. J. Emmons Briggs was a surgeon and a professor at Boston University School of Medicine. He maintained his medical offices at 477 Beacon and, by 1925, also made office space available to other physicians. J. Emmons and Flora Briggs continued to live at 477 Beacon until about 1937. They probably retired to Florida, where he died in January of 1942. On December 8, 1937, Flora Briggs transferred 477 Beacon to the Trustees of Boston University, a donation of the building for use by the Boston University School of Medicine as a dormitory. The property was shown as vacant in the 1938 City Directory. 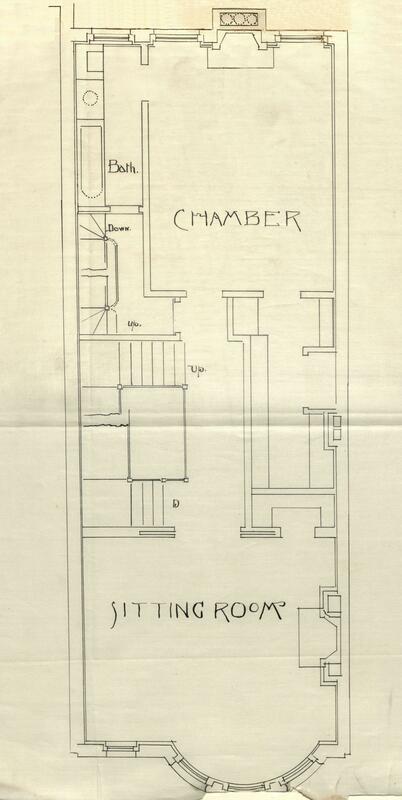 In July of 1938, Boston University applied for (and subsequently received) permission to convert the property from a single-family dwelling into a boys’ dormitory. The University continued to operate it as a dormitory, called Briggs House in honor of J. Emmons Briggs, until about 1949. On June 15, 1949, 477 Beacon was acquired from Boston University by real estate dealer Thomas J. Diab. On the same day, he transferred the property to Iva Mae (Davis) Moran, the widow of Irving Hayne Moran, and her aunt, Miss Blanche L. Burton. They previously had lived in an apartment at 366 Commonwealth, where her mother, Marcia (Burton) Davis Dudley, the former wife of Elmer Davis and the widow of Joseph P. Dudley, had died in August of 1948. Iva Moran and Blanche Burton operated 477 Beacon as a lodging house (although the legal occupancy remained a dormitory). On May 5, 1950, 477 Beacon was acquired from Iva Moran and Blanche Burton by Inez L. Gundesen, and on September 21, 1950, it was acquired from her by Francis Ralph Sundbergh, a salesman and later a realtor, and his wife, Julia (Abraham) Sundbergh. They operated it as a lodging house. They previously had been lodgers at 395 Marlborough. In April of 1953, they acquired 395 Beacon, which they also operated as a lodging house. They continued to live at 477 Beacon until about 1954. On July 3, 1954, 477 Beacon was acquired from the Sundberghs by Milton Popkin and Louis Grolnic. They also acquired 395 Beacon. On April 23, 1956, 477 Beacon was acquired from Milton Popkin and Louis Grolnic by David B. Kaplan, Nathaniel M. Shone, and Samuel Dame. On December 22, 1958, 477 Beacon was acquired from David Kaplan and his partners by Chester C. Fredberg and his wife, Celia (Ceil) (Koblintz) Fredberg. They continued to operate it as a lodging house. Chester Fredberg was a salesman with the Great Northern Finance Company. They lived at 471 Beacon and also owned 461 Beacon. On September 11, 1979, 471 Beacon was purchased from the Fredbergs by Maxine Geller, trustee of the Pelican Realty Trust. She purchased 461 Beacon from them on the same day. In August of 1979, before taking title to the property, she filed for (and subsequently received) permission to convert the property from a dormitory into six apartments. 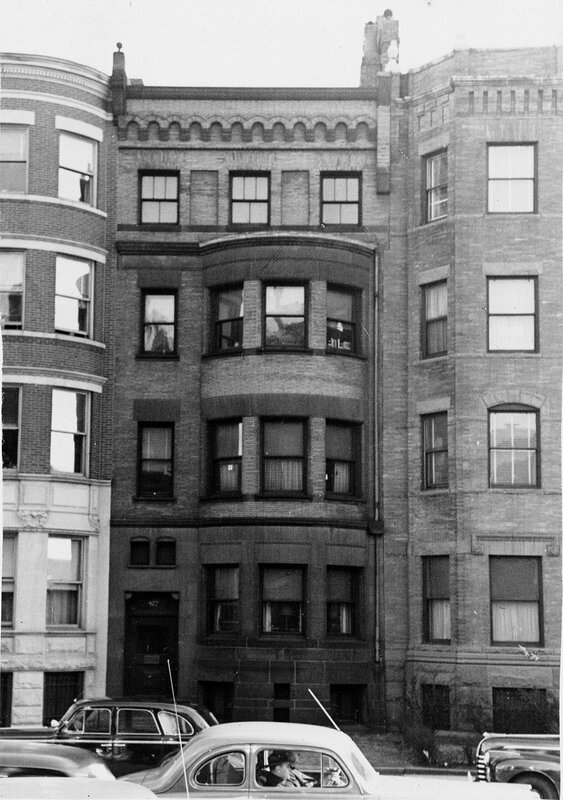 On May 20, 1981, she converted the property into six condominium units, the 477 Beacon Street Condominium.